What is NATO? And what do Trump and Russia think about it? Many analysts say the military alliance is as crucial as ever. The North Atlantic Treaty Organization is a military alliance of 29 countries across North America and Europe. Formed in 1949 in the aftermath of World War II, today NATO is criticized by Russia and President Donald Trump. The alliance is perhaps best defined by Article 5 of its founding document: "An armed attack against one [NATO member] ... shall be considered an attack against them all." During the Cold War, this pledge of collective defense was aimed at "countering the threat posed at the time by the Soviet Union," NATO says. It was a warning that an attack on an ally in Europe would result in retaliation from the nuclear-armed U.S.
NATO's first secretary-general, Lord Hastings Lionel Ismay, said NATO existed to "keep the Soviet Union out, the Americans in, and the Germans down." "NATO was a pillar of security during the Cold War, serving as a European counterbalance to the Soviet Union," said Rebecca Lissner, a research fellow at the University of Pennsylvania's Perry World House, a global policy research center. It was only after the breakup of the Soviet Union that NATO was involved in conflict, in the Balkans, Afghanistan and Libya. It has also branched out into anti-piracy missions and earthquake relief. The only time NATO triggered Article 5 was after the terror attacks on 9/11. In response, NATO aircraft patrolled U.S. skies and its ships were dispatched to the Mediterranean Sea to counter terrorism and trafficking. Which countries are in NATO? The 12 original signatories of the North Atlantic Treaty were the U.S., Canada, the United Kingdom, France, Italy, Portugal, Norway, Denmark, Iceland, Belgium, the Netherlands and Luxembourg. Greece and Turkey joined in 1952, followed by West Germany in 1955 and Spain in 1982. After the fall of the Soviet Union, the Czech Republic, Hungary and Poland became members in 1999, then Bulgaria, Estonia, Latvia, Lithuania, Romania, Slovakia and Slovenia in 2004, and Albania and Croatia in 2009. Montenegro, NATO's 29th and most recent member, joined in 2017. Bosnia-Herzegovina, Macedonia, Georgia and Ukraine have expressed interest in joining. NATO has an "open-door policy" on welcoming new members, however hopefuls must fulfill a complex set of military, economic and political criteria. After the Cold War, military spending was slashed across NATO's membership and some commentators questioned its relevance in the modern world. That changed in 2014 when Russian President Vladimir Putin annexed Crimea and allegedly supported separatists in eastern Ukraine. This refocused attention on NATO as a bulwark against perceived Russian aggression. 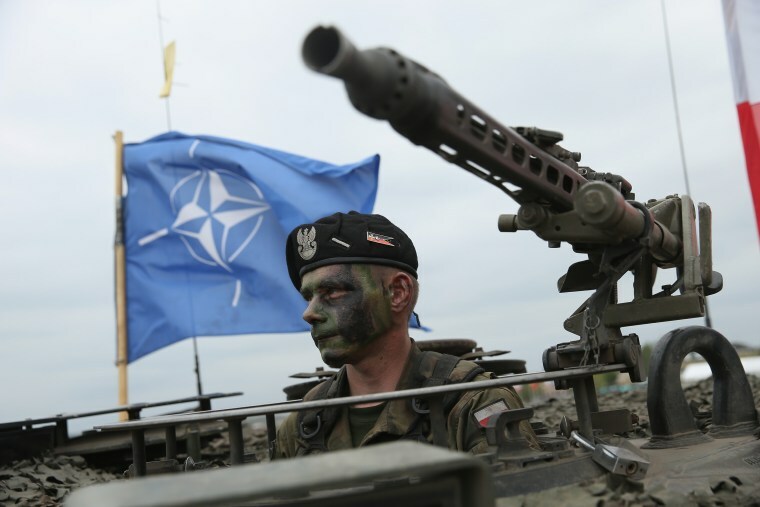 "Any attack on NATO would be an extremely high-risk gamble for Russia and any other state adversary," said Justin Bronk, a research fellow at the Royal United Services Institute, a London think tank. "The core purpose of the alliance — to ensure the collective defense of even its most militarily vulnerable members — remains flawed but still at least somewhat effective," he said. "NATO is returning to its original purpose of deterring aggression by Moscow," she said. Why has Trump criticized NATO? The president sent shockwaves through Europe when he called NATO "obsolete" while on the campaign trail. His main complaint was that its members are too stingy. Technically, he's correct. Only four members spend the 2 percent of GDP on defense that NATO recommends: the U.S., U.K., Greece and Estonia. This has led to "an outsized burden carried by the United States," says Bronk. The president has since retracted his "obsolete" comment, and his administration has not backed away from NATO as some had feared. However, many in Europe will not forget that it took Trump five months to explicitly commit to NATO's principle of collective defense. Who else is opposed to it? Putin sees NATO as an aggressive and expansionist power creeping toward his borders. He told NBC's Megyn Kelly last year that it would be helpful if it was "falling apart." Others in the West echo these criticisms. One allegation is that NATO is guilty of "antagonizing Russia" and "extending security guarantees to states that would be hard to defend ... against a Russian attack," according to Lissner at Perry World House. While these critiques have "some legitimacy," Lissner believes the answer is not dissolution but modernization. "The challenge," she says, is for NATO to balance "traditional security threats," such as Russia and nuclear-based concerns, with nontraditional dangers such as terrorism and cyberwarfare.